Export data to Excel or Ascii or Custom Format. The Custom format option allows you to define an Xbasic function that creates the file. Specify the format of the exported data. If you select Custom, you can define your own Xbasic function to create the export file in any format that you want. For Excel select 'Excel' to create a .xls file and 'Excel-XLSX' for a .xlsx file. Choices include Excel, Excel-XLSX, Comma delimited ascii, Tab delimited ascii, Custom. Specify the name of the Xbasic function that will create the custom file you want to export. This function must be defined in the Xbasic Function Declarations property. TIP: Click the hyperlink at the bottom to get the correct function prototype. Specify what fields should be exported. Specify the default filename to use when saving the file on the user's computer. The user can override the suggested name. If you set the name to <Default>, Alpha Anywhere will generate the filename. Specify if the exported file should be zipped before it is downloaded to the user's computer. Should 'hidden' fields be exported? ('Hidden' fields are not necessarily actually hidden when the Grid is displayed - they could be shown in another column's Free-form layout section). Should the column headings in the export file be the same as the Grid Column Headings? If unchecked, the field name is used. Specify if only the records in the current Grid query should be exported, or all records in the Grid. Choices include Records in current query, All records, Current record only. 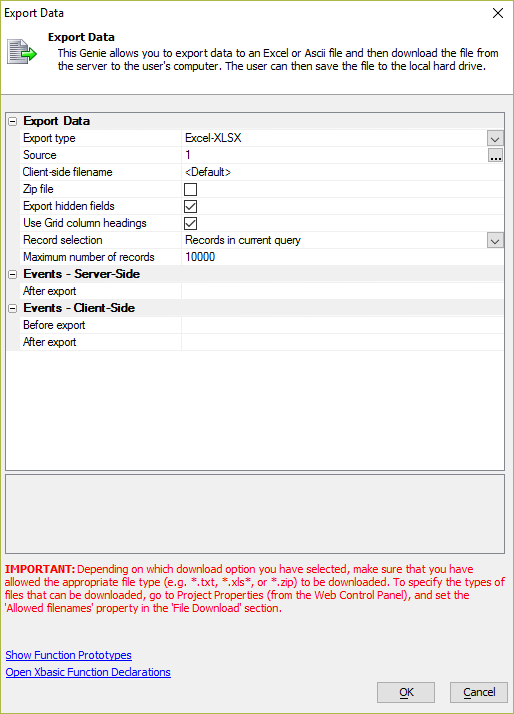 Specify the maximum number of records to export. Set to 0 for no limit. Specify if the query is against DBF tables or a SQL database. Choices include DBF, SQL. Specify the name of the DBF table. Specify the SQL Select statement. You can use arguments in the filter expressions that you define. Using arguments for variable data makes it easier to write your filter expressions. Specify where each argument that have defined gets its value. Arguments can get their values from a value in the current Grid row, a session variable, or a literal value. Specify the name of the Xbasic function to call after the records have been exported and the export file has been created, but before the file has been sent to the browser. Function is defined in Xbasic Function Declarations section.